A beautiful resort in North Phoenix. A friendly, tranquil place with all the amenities you can imagine. Close to golf, restaurants, shopping & sporting events. We hope you will choose to visit soon and experience all we have. Terrible place. Each RV is within 10' of the next one. Cost with GoodSam discount $46, plus a short stay fee of over $5. At hookup, 30 amps was not steady and kept blowing my safety breaker so had to use 110 with adaptor. No WiFi. No cable... told air atenna works great, but I found that it was not true. No picnic table or firepit. A cement slab and a bench only. I paid a high price for nothing very grand. Great park for visiting the Phoenix area. Close enough to the major highways to get around Phoenix, but far enough as to be quiet. We enjoyed our stay here and would definitely stay here again. We prefer the pull thru sites that are very large. Our first trip to the Phoenix area. 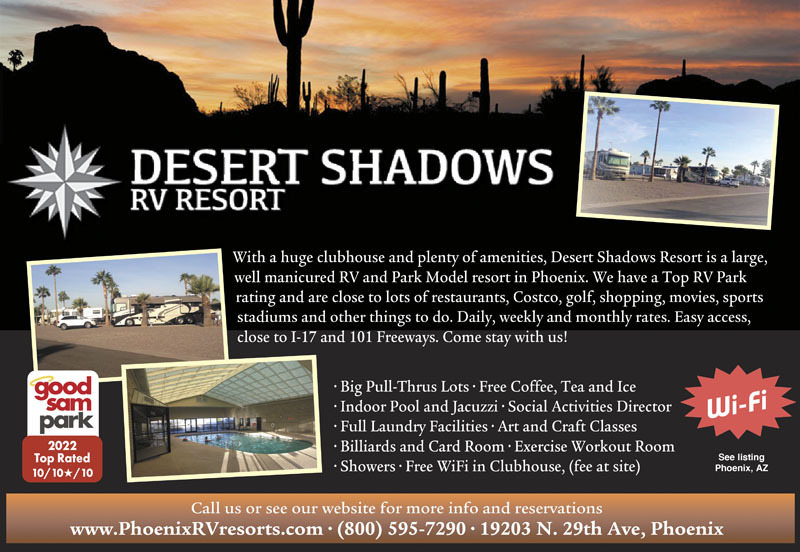 We booked and stayed at Desert Shadow mostly due to the Good Sam 10/10/10 rating. The staff was friendly however the resort Good Sam Appeal/Facility ratings is not accurate. The resort is outdated and shouldn't be rated more than a 7 at the most ( would like to know how Good Sam based a 10 for the Appeal rating?) with regards to the Appeal/Facility Good Sam rating. The gym facility and internet services were not at par with other 10/10/10 campground we visited in the past. We stayed last week at another Phoenix-area RV Resort (Canyon Vista/ Superstition Rv Resort ) and the sites and the resort was by far superior and more appealing. We booked 7 days and will be leaving after 3 days. Common areas are clean and staff seemed very friendly. Mostly a mobile home park. We stayed at this park in a pull thru site. There is no wifi or cable unless you are a long term resident. All amenities seemed like they were mainly for residents. Showers were closed due to renovation (which we were not informed of). Asked if children were allowed and we're told yes but, Children are only allowed in pool area at certain times (12 to 2 and 5 to 7). Beware to keep items locked up, we had two totes and a bag of tools stolen. Indoor pool is nice. Check hours for children. Quiet stay. Close to everything you need. This park is definitely not for small trailers. It is all big rigs and rental units. Good Sam says the restrooms are rated a 10, but they really don't even have restrooms except those associated with the pool. Considering the rates, they should have wi-if and cable at each site, which they do not. This park is old & in need of an update.. The concert pads are not big enough for the big rigs.. The sites are really un level.. Most of them slop to the west.. So you feel like you are walking sideways inside the rig.. The I17 traffic notice is really loud..The palm tress are in the way so you cannot open your slide, doors or awning.. The showers are really old.. NO WIFI or CABLE.. Over priced for what you get .. Mostly park models with rvs through in-between..Will not stay here again.. If I only rated this park on its amenities, I would give it a 9 or a 10. The sites are what brings the rating down. This is more a park model resort than an RV park. The RVs are in "lots" instead of "sites" and are squeezed in between park model homes. The lots are very unlevel, tilting towards the street. We needed to use several levels of leveling blocks under our front wheels in order to level the coach. They are also very close together. If our back window opened up, I could reach out and shake hands with the people behind us. And with our living room slideout extended there is only about a foot between it and the pickup truck belonging to the person next to us. Free cable and wifi are available at the office complex only. In order to get cable at your site, you have to contact the cable company and pay their rates. Same for wifi. We don't need cable and have our own wifi hotspot so it didn't really bother us. They don't accept credit cards for monthly stays, only cash or check. I suggest you pay the deposit for the back gate key so that you can get to a traffic light if you want to make a left turn on the highway. The amenities are another thing altogether. The laundry room is large and clean, with plenty of room on the tables to fold your clothes. Washers cost $1.25, dryers are $0.50 for 20 minutes. There is a sitting area with a tv and magazines in the laundry room. There's a large, heated indoor pool and hot tub. Outside are shuffleboard courts and bocce ball courts. An extensive library also has two tables for jigsaw puzzles and several computers. There are also a billiards room, card room, exercise room, etc. There is always some activity going on at this park. Very nice Park! Very clean and comfortable. We were traveling with kids and the only issue we had was the limited hours that they were allowed in the pool area. Otherwise, highly recommend to everyone! We stayed for 2 weeks because my wife needed to be at the Mayo Clinic Hospital. The staff was very accommodating with our changing schedules which made our stay much better. It is a very clean friendly park with a really nice pool and one of the best hot tubs I've ever been in. I've not been to a park before that is part full time MH and part camping, it has much more of a community feel to it with everyone being very friendly and helpful. There was even a Chrismas show one night and a pancake breakfast another morning! I'd stay here again! We stayed 2 nights in a pull thru site. Full hookups were used. No Wifi in the park. The staff was very helpful and courteous. The facilities were nice. Ice is available in the recreation area. Mostly full timers stay here. Thank you for your stay at Desert Shadows in Phoenix, AZ. 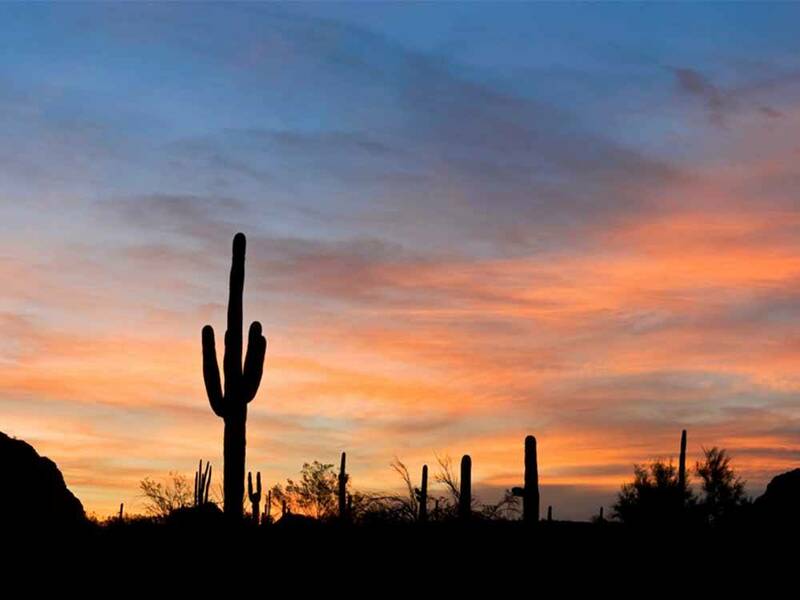 We hope you enjoyed your traveling experience and beautiful Phoenix. We are sorry your wifi experience was not what you expected, but we do have free wifi in our clubhouse and lobby building and we also have wifi at each individual lot for a daily/weekly fee. We also recently upgraded the wifi at each site to run faster and better. Thank you, Travel safely. While the facility contained several activities for guests including billiards and very clean indoor swimming pool with jacuzzi, we felt as outsiders using the facility since over 90% of the RV Resort is occupied by long term residents. We would not recommend this RV Resort for a stay beyond 1 night as we found several of the residents and management to be rude when we used the facility. Stop driving your RV and move into your very own park model. Enjoy all the perks of resort living with countless activities, events, and amenities on site. Let our helpful staff find your perfect Snowbird or year round home.